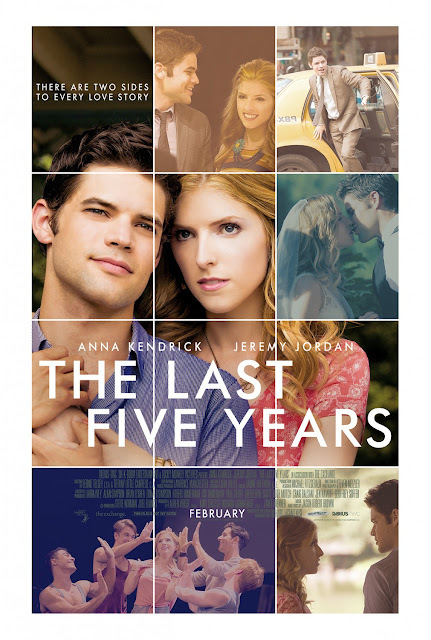 Movie: "The Last Five Years"
After a bitter breakup, Jamie (Jeremy Jordan) and Cathy (Anna Kendrick) recount the last five years of their failed relationship and marriage through song, with Cathy starting at the end of their relationship and Jamie recanting it from the beginning. "The Last Five Years" opens with Anna Kendrick, who plays Cathy, reading a breakup letter from her husband Jamie, played by Jeremy Jordan. Cathy is a struggling stage actress who lives in New York, but has to spend her summers in Ohio in some small town theater because it's the only work she can get. Jamie, on the other hand, is a successful author who has had numerous best-selling books. They had met five years earlier before he was successful and before she was relegated to small town theater. The story is told in a non-lineal fashion, jumping from the end to the beginning to the middle to the beginning to the end. This presents a unique way of storytelling, with Cathy beginning at the end of their marriage and Jamie beginning at the start of their relationship. It's sort of fun to see a relationship unfold in a juxtaposed way, though it can get confusing in the middle of the film since this timeline jumps around. It also doesn't help that everything is done in song, which is not a problem for us normally, but unfortunately, it can get distracting here. It's not simply music interwoven with dialogue, either. Just about everything in the movie is sung and only about 5% of the dialogue is spoken, if that much, even. Obviously, how much you like this movie will be directly contingent upon how much you like or dislike musicals. The story being told this way does makes it a little hard to follow, but the audience does get the gist of their relationship by the time everything is said and done. Cathy and Jamie are similar in many ways, but are also very different people even though they are both aspiring artists. They both have dreams of making it big when they start their relationship, only Jamie's career takes off and Cathy's doesn't. He is excited that she is different from anyone he's ever dated and she feels like he is the one she's been waiting for. She eventually wants to maintain her own identity and just wants him to love her, and with Jamie's continued success comes money, parties, and the temptation of other women. All of this leads to fighting, resentment and their eventual breakup. Anna Kendrick and her voice are probably the strongest component of the movie. Damn, can she sing! Most the songs are at least tolerable, some are even very good ("Still Hurting" and "See I'm Smiling" are my two favorites, which I haven't been able to get out of my head), but none of them apart from these one or two are all that memorable. Jeremy Jordan has a good voice as well, but his character winds up becoming very unlikable, which is often the case in real relationships. These two carry the whole story on their own since they are really the only two performers. Anyone else, however, is little more than a background decoration. Kendrick and Jordan do have good chemistry with one another, though, and we have a feeling if they didn't, it would have been all the more tedious to watch, especially since it's a musical. The pacing is a little slow, something many musicals suffer from, and this one in particular feels more like listening to an album as opposed to watching a narrative story unfolding. We enjoy that the couple breaks up since most movies make the protagonists get back together regardless of indiscretions, but as a whole, we felt like something was very lacking in "The Last Five Years," though its premise is unique.